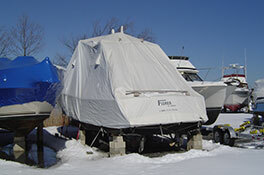 Winter Boat Covers – Harold F. Fisher & Sons, Inc.
After divesting itself of their winter storage business in 1991, Fisher and Sons returned to the market in 2003. 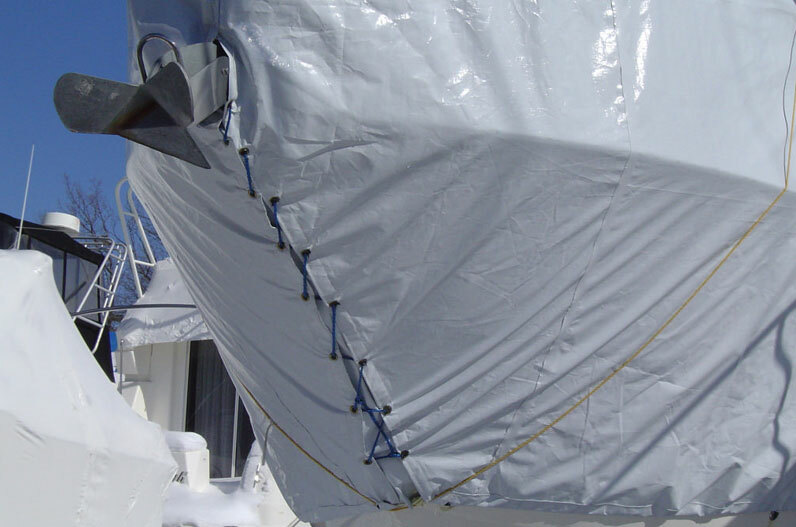 Spending three years of modifying different versions, a new model of winter boat cover was launched to go along with the tried and true Canvas Winter Storage Cover. Using an industrial Vinyl and a heavy grade Poly, an economical and lightweight cover was developed. 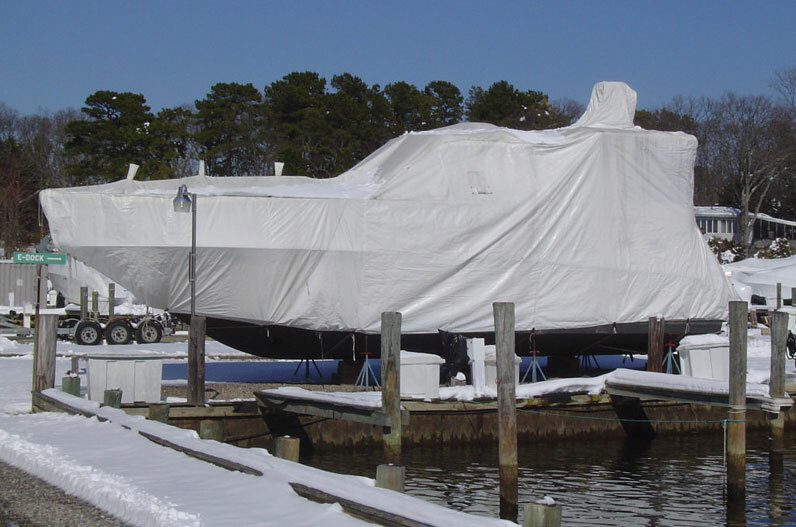 With half the weight and approximately 60% of the cost of the canvas cover, the Vinyl/Poly Cover has steadily gained a presence in the winter boat cover market. In the few years that it has been on the market the Vinyl/Poly Cover is covering boats from Massachussetts to Maryland. COVERAGE: Everything topside Down to the waterline. STRESS POINTS: Reinforced at key wear points. HOLD DOWNS: Webbing loops every 5 – 6 feet with draw rope around bottom of cover. Grommet lace strip at bow. The Vinyl/Poly cover has Additional hold down rings along front of bow rail. ACCESS: A zipper or double zipper door are available as an option to be placed where requested. SUPPORT: Sleeves for 2 x 4s or vertical pole pockets are placed where needed. It is recommended that larger boats with canvas covers be framed. ACCESSORY COVERAGE: Radars, GPSs and TV antenna are covered with Individual pouches attached to cover. Outboard Motors can be covered or left uncovered. Outriggers and towers can be accommodated. INSTALLATION: Instructions are provided with each cover along with a list of What will be needed to install the cover such as 2 x 4 lengths And number of vertical supports. MEASURING: Fisher and Sons measures each boat to insure proper fit of the Cover and exact location of any accessory. WARRANTY: 1 Year for fit and workmanship. H F Fisher and Sons reserves The right to insure proper installation of cover.